With the release this week of The Hobbit: The Battle of the Five Armies Extended Edition on Blu-ray and DVD, folks have been sitting down to watch the many hours of extras provided in the included ‘Appendices’ footage. Starting with an article on The Guardian newspaper’s website, one particular part of Peter Jackson’s comments (in ‘The Appendices Part 11: The Gathering Storm’) on the making of The Hobbit trilogy has gone viral online, unleashing much debate among fans who love or hate the movies. You can read the article in The Guardian here. In short: in candid and insightful remarks, Jackson admitted that the short prep time he had after director Guillermo del Toro reluctantly had to leave the production and Jackson stepped into the breach, left him scrambling and ‘making it up as I went along’. He discusses how, in the early days of shooting, he would be on set ‘winging it’; eventually, he realised that he had to postpone shooting the epic battle from which the third film gets its title, to ‘clear his head and have some quiet time for inspiration to come about the battle, and start to really put something together’. However, in ‘The Gathering Storm’ footage (specifically in Chapter Five, ‘The Gathering of the Clouds’), Jackson goes on to explain the various ways in which they overcame the obstacles encountered during filming; and indeed, even The Guardian’s own article (headline aside), implies that Jackson found ways of making things work, even in the ‘very high pressure situation’ in which he found himself. Many fans agree that The Hobbit trilogy does not rise to the standards of The Lord of the Rings film trilogy. Jackson himself may be of that opinion – who knows? It is certain, however, that he would never want to belittle the huge amount of time, work and talent poured into these films by cast and crew; so naturally, he and folks at Wingnut Films were distressed by his comments being taken (as they say) ‘out of context’. The You Tube clip is a 6min cutdown of a 45min featurette (one of many) from the recent Battle of the Five Armies Extended Cut DVD, entitled “The Gathering Clouds” [sic]. Somebody has decided to create this cutdown using only the sections of “The Gathering Clouds” that discuss the difficulties faced, not the positive ways they were addressed and overcome – which are also covered in this and other featurettes. Peter has never made a secret of the fact that he took over the Hobbit directing job with very little preparation time remaining before shooting had to begin. It was a challenge he willingly took on. His comments are an honest reflection of his own personal feelings at times during the movie’s production. However they are not a reflection of either the actual production of these 3 movies – which was very tight, professional, happy, and finished on schedule and budget – nor do they reflect the finished result. Peter is very proud of the 3 Hobbit movies, and actually regards this period as one of his happiest film making experiences – something he has said publicly many times. Shifting 2 months of shooting from 2012 into 2013 to allow the long and very complex battle sequence to be properly planned and shot, had no impact on the budget or release date. It is exactly what any responsible director should do, given the compressed pre-production time Peter had for these 3 technically difficult movies. Ever since The Frighteners, Peter has tried to provide fans with honest, detailed, “warts and all” behind the scenes featurettes – compared to the usual bland Hollywood publicity material seen on most other DVDs. It’s a little sad to see desperate media outlets hijack this honesty to feed their ravenous appetite for negative sensationalism. Before receiving this statement, here at TheOneRing.net, in the interests of fair journalism, we had shared on Facebook The Guardian article, but also posted the following. ‘… the short clip which has been creating so much press around the world is taken out of context and doesn’t include any of the positives! It’s great that PJ is honest and frank enough to admit the struggles they faced in making these films; AND the Appendices also explore some of the solutions they found to those struggles. The story out there right now has picked on one angle of PJ’s candid conversation; watch the whole 45 min of ‘The Gathering Storm’ in the Appendices for the full story! Each fan, of course, has his or her own opinion of The Hobbit movie trilogy. Staff at TORn are divided too, naturally; some of us love the movies, some hate them, and many of us are somewhere in the middle of the road. (Read my own review of The Battle of the Five Armies Extended Edition to see that I’m not someone who always says, ‘Everything is awesome!’ about these films!) It seems unfair, however, to take comments out of context, and make it seem as though Jackson is not proud of these movies, or that he does not respect the efforts of all those involved in their creation. As Wingnut Films’ spokesman remarked, Jackson’s honesty in these ‘behind the scenes’ clips is refreshing and fascinating – it would be a pity if he were put off from being so open, by unfair reporting of his words. Personally I love this comment Jackson made, shown in the Appendices footage: ‘There’s no magical answer for it and that’s the truth of it.’ I think we can all recognise the validity of this aphorism, to any project into which any of us has poured our time and our labours – sometimes with mixed results. Jackson’s remarks give us a real insight into the huge work involved in making a movie, and the crazy, often chaotic scramble which is the nature of the set of an epic film (or three, in this case). I hope he’ll continue to share such frank commentary with us, the fans; and I also hope the fans will continue to be passionate – on both sides of the argument! – in their reaction to these films, and indeed to any art which comes out of Middle-earth. Here’s the cut of footage which started all the furore:. 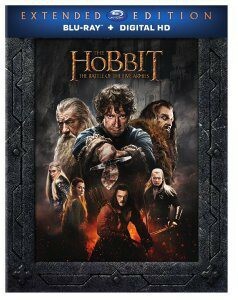 And you can get your own copy of The Hobbit: The Battle of the Five Armies Extended Edition here, so you can watch The Appendices and judge for yourself! This story is posted in the following categories: Blu-Ray, Director news, DVD/Blu-Ray, DVDs, Guillermo Del Toro, Headlines, Hobbit Movie, Lord of the Rings, LotR Movies, Merchandise, Peter Jackson, Production, Shop, Studios, The Hobbit, The Hobbit: The Battle of the Five Armies, Warner Bros. No Comments » . Please click on a category name to view all stories related to it.